If you’re here, you’re probably looking for information on how to look after guinea pigs and as a first time guinea pig owner, this is a guide to help you as you start out in the world of guinea pig care. We will go from the absolute things you need for your guinea pig and then move onto the things that you may not know about caring for your guinea pig. So lets dive right in…. What you need to buy for your guinea pigs. Here are 8 things your guinea pig definitely needs. Fresh Timothy Hay. What’s that? good question! Its good stuff, honest! Your local pet store can supply most of these things. a garden with grass to chew on. Make sure that the guinea pig hutch/pen/cage is spacious, waterproof, and fun. One guinea pig needs 4 sq ft of space at a minimum. The more space the more they will appreciate it. They need food like hay, guinea pig pellets, greens and vegetables. They need a water bottle that measures 1 quart. Make sure that they have clean fresh water at all times. Clean out poo each day from their cage, and then once a week give it a proper clean to keep it clean of parasites. This means removing the guinea pig from the cage and put it elsewhere for that time so you can give it a proper clean. But these are the things I definitely didn’t know about when we first got a guinea pig, but have picked up along the way. Guinea pigs need a companion. Most people don’t realise this but they are social creatures and get very lonely living by themselves. If you want them to be at their happiest and best, then get them a friend from a rescue. Guinea Pigs should be kept in two’s at a minimum, but if you can they’ll be happiest in threes, fours or fives. They don’t like cold drafts or weather extremes.Simple rule of thumb, if you wouldn’t’ stay outside, your guinea pig is probably not liking it either and should be brought in the home or at least an outhouse. They need hiding places. You can use old shoe boxes, breakfast cereal boxes, flowerpots and anything else like this. Watch where you keep them. Steer clear of wire bottom cages, instead use cages with solid floors and line it with newspaper or hay. A guinea pig’s main food source should be fresh timothy hay. Give them as much as they need. Beware of foxes and other animals getting your guinea pigs at night if they’re outside. lock hutches and cages. They need vitamin c supplements either from high vitamin c food or most preferably vitamin c tablets. You can also get guinea pig pellets that contain vitamin c.
They need a handful of fresh vegetables a day like peppers, cucumbers, carrots and kale. They love to play. Give them ball’s and low ramps for exercise. They love things like branches to clamber and chew on. Give them plenty of floor time each day in a place that is free of wires and other dangers. Their nails grow. Purchase a set of nail clippers to cut their nails on a monthly basis. Consider getting a run. They need plenty of space to run around. Don’t let small children handle your piggie. They need to be handled with care and gentleness. Clean your water bottle out weekly to keep it clean of algae. Pheewwww. More involved than you thought? Guinea pigs are amazing animals to keep and they’re many people the world over who have fallen in love with these amazing creatures and there are lots of amazing people who work tirelessly to ensure that they are protected and looked after well. One plea. Be a good guinea pig owner! If you’re here, then you probably want to be and will be as well. There are lots of great places you can go to meet other guinea pig owners as well and share stories, laughs and pick their brains, the more you dive in, them more you’ll learn about good guinea pig care. 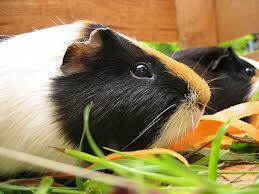 This site contains loads of articles on looking after your guinea pig. Be sure to subscribe, like/follow us and keep up to date with the posts. We have just become proud owners of 4 guinea pigs, but feeling a bit worried. We have read everything and made sure they have all they need and getting lots of attention. But one seems to have a big bottom area..is this normal? Hi, I am a first time guinea pig owner and have owned 2 female piggies for around 2 months. one is a 6 month old and the other is 2 years from what I was told at the rescue shelter. I adore those two and really enjoy their company. I have a few questions about them though. this article has been a great help because I didn’t know they would actually like vegetables and discovered the 2 year old, Lu, enjoys carrots mostly and the younger one, coco, enjoys leafy veggies like lettuce and spinach leaves. what is the best chew toys and products of that nature to get them? You mentioned a run, I normally just let them run around in the living room each day for exercise since I live alone and they seem to enjoy it but is there a certain thing I can buy for them to run around in? I tried the ball but they seemed to not care for that too much. Seed sticks are good for them to chew on, as it will keep their teeth down, and they will enjoy it. A C&C cage is good a spacious for them to run around in and they will enjoy it also. Guinea pigs don’t have the flexibility in their spine that hamsters and such do therefore a wheel or ball is not good for them. Hoe this helps. A ball causes the spine to bend in an unnatural shape. Therefore completely unsafe for a guinea pig. They are really fun I have had several after meeting my fiancée and they come with all different types of personalities. I have learned that with a spacious cage and run time alot of mine ran laps in their cage it is adorable. cool article, I was wondering if I need to spend extra time with my piggies if I only have 2. © 2019 onlineguineapigcare.com - All rights reserved.